I'm trying to create a calculated column which will return a specific name based on the date in another column. If the 'week ending' column date is within 28 days, I need the calculated column to say JOHN. If the 'week ending' column date is more than 28 days away, I need the calculated column to say KARL. ….all of the entries say 'KARL' regardless of the date. Does the week ending column show a date or the difference between two dates(week ending date and Today)? 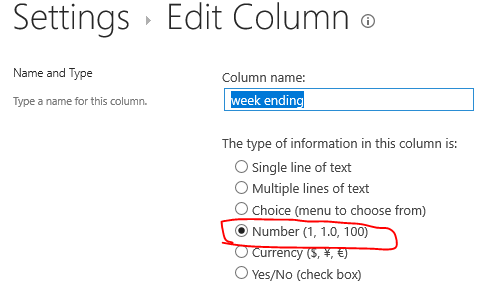 Is the week ending column a date column or a text column? 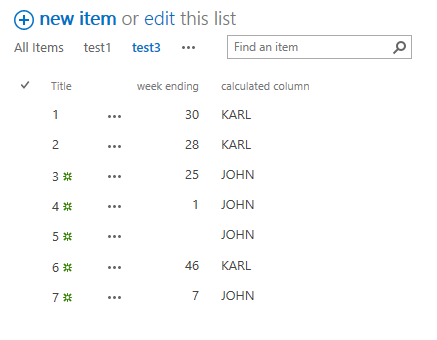 Note: If the week ending column has no value, the calculated column will display "JOHN", because the value is within 28.